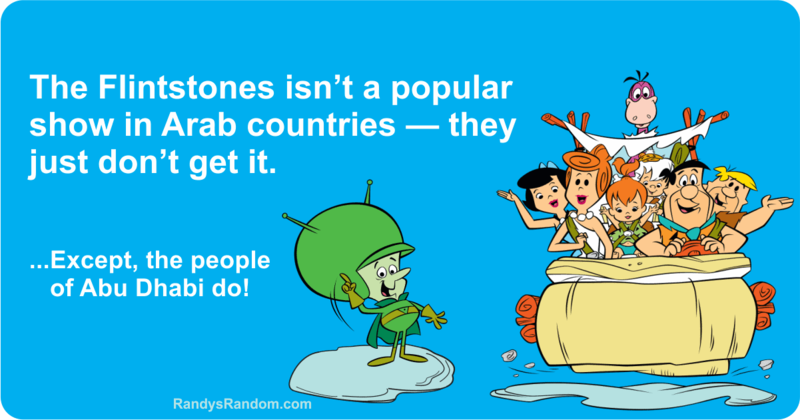 The Flintstones isn’t a popular show in Arab countries — they just don’t get it. …Except, the people of Abu Dhabi do! I know, I know: awful! But let me redeem myself. The Great Gazoo from planet Zetox, pictured to the left, was voiced by Harvey Korman, later to become famous on The Carol Burnett Show and Blazing Saddles. The Flintstones ran in prime time from September 1960 to April 1966, making it the longest-running prime time animated show …until The Simpsons came along. They’ll be hard to beat: they’ve been running for 29+ years — and counting.